Michael Carney and Sebastian Lew are two students at the University of Illinios at Chicago's College of Urban Planning and Public Affairs (where I graduated in 2010). They emailed me in October 2010 asking about bike crash data. I didn't have it at the time but I helped them find and obtain it. Because of them, the Crash Portal and all related projects were made possible. For many years, bicycling in the United States has been viewed as a recreational activity or a child's means of transportation. Cycling for many is left to park trails and cul-de-sacs. While commuting by bicycle may be starting to slowly catch on, urban cycling is still perceived by most people as being too dangerous. This study aims to address that perception by analyzing the safety conditions for bicyclists in Chicago. To achieve this, the study uses Geographic Information System (GIS) analysis and mapping technology. 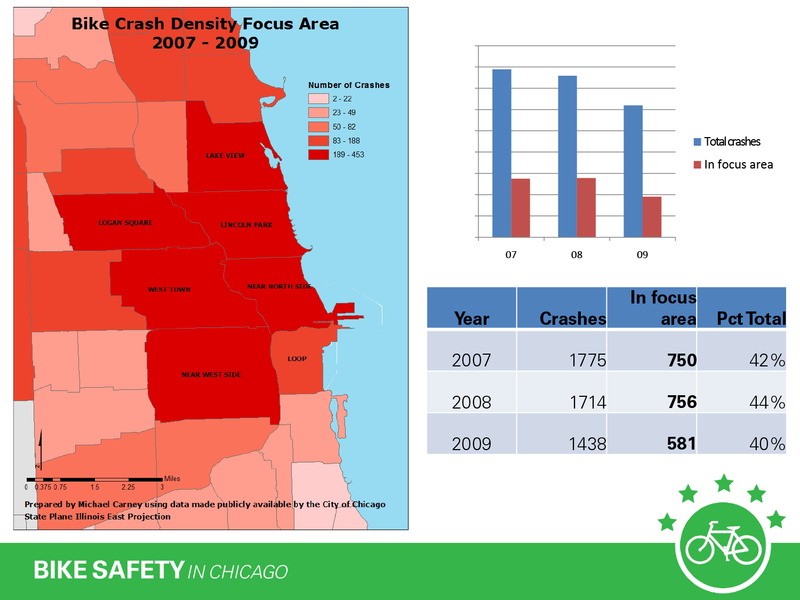 Utilizing bicycle crash data from 2007 through 2009, acquired from the Illinois Department of Transportation (IDOT), the research analyzes and investigates locations with high bicycle accident occurrences and characteristics of crashes—including types of injuries and time of year. It also investigates the levels of ridership compared to where the crashes take place. 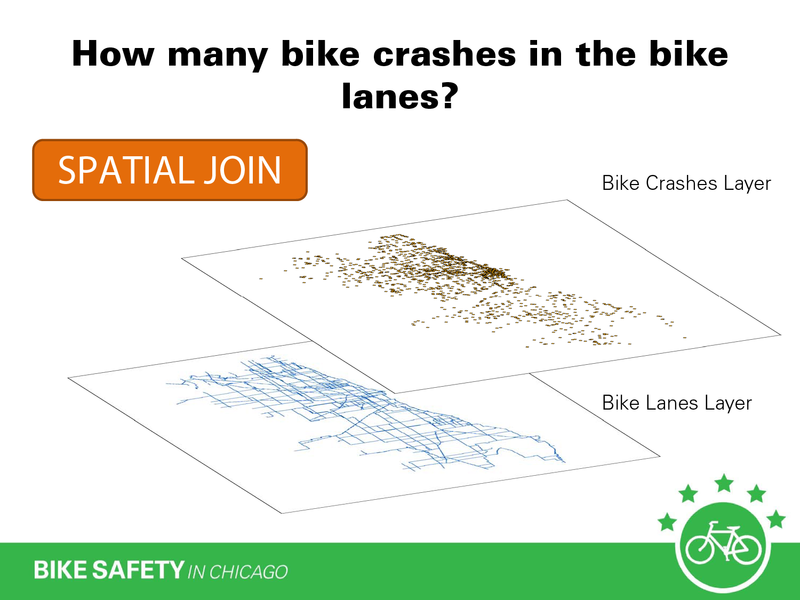 Finally, the study tests the effectiveness of Chicago's bikeway network. The paper concludes that safer bicycle infrastructure is needed to promote cycling as an economically and environmentally beneficial mode of alternative transportation in Chicago. This study aims to help transportation professionals make recommendations for improving bike mobility and safety. Download the entire presentation (6 MB PDF) Michael gave at the Transport Chicago 2011 conference on Friday, June 3, 2011. There may be more crashes in the afternoon commute than in the morning because there is generally more traffic in the afternoon. There are more recreational drivers, shoppers, etc. out at that time. Do you know what kind of education is being aimed at motorists to improve bike safety? Do you think there's a reason why most of your hot spots are at 6 way intersections? Did you find any anomalies between crash counts and ridership counts? ie. high crash amounts in low count spots. Have you looked into people's perceptions of safety in regards to riding through dangerous neighborhoods?